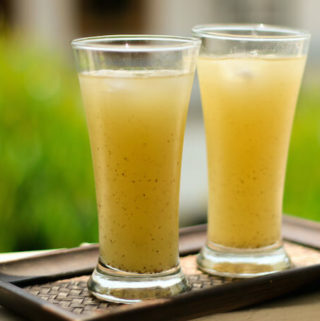 Aam panna is a refreshing summer drink made with raw green mangoes. Raw mangoes are boiled, peeled, puréed and then flavoured with sugar, salt, cumin, mint and chilli. The aam panna concentrate can be stored for weeks and even months. Due to its high vitamin C content, raw green mango is an excellent cure for battling heat and also fight sunstrokes. Even the Indian spices used in the recipe such as black salt, mint and roasted cumin are very soothing during summers. High vitamin C in raw mangoes is a great antioxidant. Raw mangoes are low in calories (65 calories in 100 gms), which makes it a dieter’s delight. They are extremely rich in fibre and thus great for digestion, and relieving constipation. They are high in minerals with magnesium and potassium. This helps in controlling blood pressure and is important for healthy muscles. 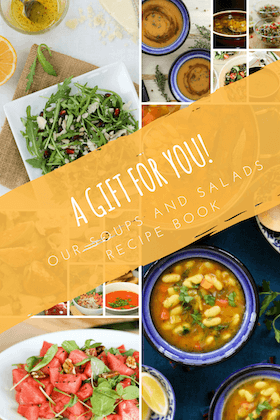 Every mango season, while we devour the ripe mangoes, mom would surprise us with delicious raw mango recipes during dinner. The green mango is a culinary delight. From chutneys to salads, from drinks to curries, and from rice to desserts; raw mango is a versatile cooking ingredients in an Indian kitchen. I love it’s tangy sourness. You can dice it and add to cornflakes bhel or grate it to make delicious green mango and raw papaya salad. When in season, I also add it to my special gathiya chutney for a sour twist. My mom actually freezes chopped raw mango to use in chutneys later in the year. I love love how it subtly flavours rice in the South Indian style raw mango rice recipe. This recipe comes from my mother’s home-science notebook! I don’t think it exists as a subject any more. 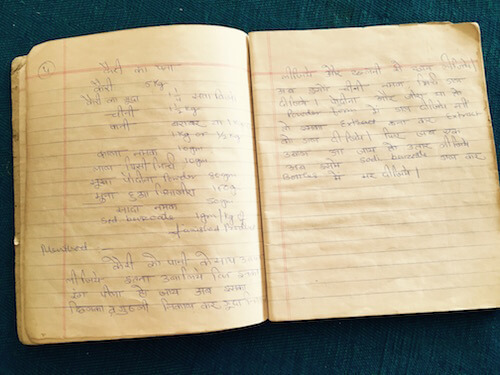 But I had found this notebook in a truck at my maternal grandmother’s home long time back and it my most treasured cookbook! 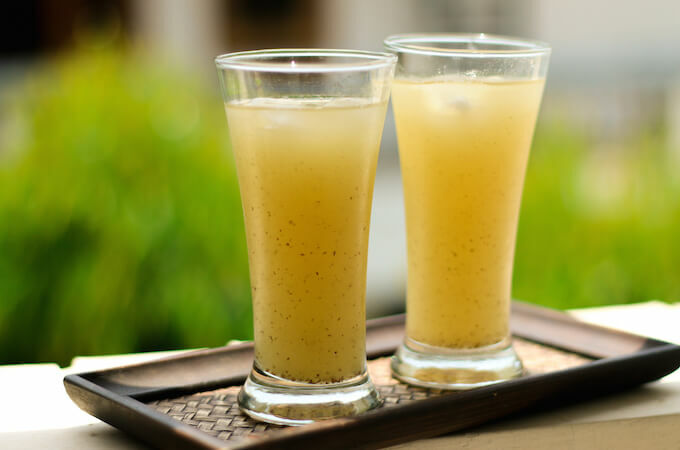 Aam panna juice is a refreshing summer drink made with raw green mangoes. Raw green mangoes are boiled, peeled, puréed and then flavoured with sugar, salt, cumin, mint and chilli. The best part is you can store the concentrate for months and make a glass of chilled aam panna whenever you feel like it! Boil the raw mangoes in a pot full of water till it turns yellow. Remove from heat, drain and carefully peel the mangoes. Separate the pulp. Mash it in the bowl with a spoon or purée with a hand blender. Add sugar, salt and all the dry spices to the pulp. Return to heat and cook till there is one boil. To serve, add water to the concentrate and mix well. Pour over ice cubes in tall glasses and serve cold. *If you want to keep the aam wanna concentrate for longer than a few weeks, you should add a little preservative like sodium benzoate (1gm per kg of finished concentrate) and then store in bottles for 2-3 months. For a sugar-free aam panna juice, you can also use grated jaggery in the concentrate or other sweeteners like maple syrup or agave but then don’t add it to the concentrate while boiling. Add the syrup right when you are preparing the drink for serving. Lovely recipe, Ashima. Great tip on using sugar substitutes. For a twist, one could also add crushed mint to the Aam Panna for more flavour and nutritional benefits. Thanks, Nimisha! Yes, mint is a great addition too!